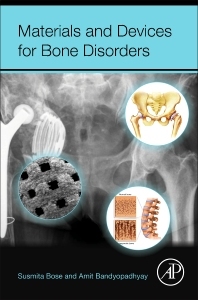 Materials for Bone Disorders is written by a cross-disciplinary team of research scientists, engineers, and clinicians and bridges the gap between materials science and bone disorders, providing integrated coverage of biomaterials and their applications. The bioceramics, biopolymers, composites, and metallic materials used in the treatment of bone disorders are introduced, as are their interactions with cells, biomolecules, and body tissues. The main types of bone disorder and disease are covered including osteoporosis, spinal injury, load bearing joint diseases, bone cancer, and forms of cranio-maxillofacial disorders. Bone disorders are common across all ages. Various forms of bone disorders can change the lifestyle of otherwise normal and healthy people. With the development of novel materials, many forms of bone disorders are becoming manageable, allowing people to lead a fairly normal life. Specific consideration is given to areas where recent advances are enabling new treatments, such as the use of resorbable ceramics in bone tissue engineering and drug delivery, newer polymer-based implants in load-bearing contexts, and engineering biomaterials surfaces including modifying surface chemistry. Ethical and regulatory issues are also explored. 12.2 What is the Path to Commercialization? 12.3 The Research Topic—The Big Idea. Is it really that Big? 12.7 Claims—Are They Broad Enough to Keep the Competition out of This Space? 12.8 Freedom to Practice/Operate—Can Some Other Patent Stop This Technology? 12.9 What Are the Regulations Around This Big Idea Product? 12.10 What Is the Cost of Making This Product?